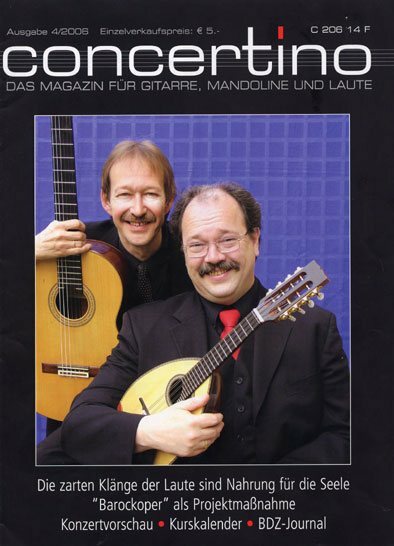 “World premiere recordings” says the CD cover, adding “for mandolin and guitar”. These are no newly found works by the Salzburg master. That would have been sensational! Instead these are arrangements for this somewhat unusual combination of instruments. The music itself is well-known, some of it more suitable to the instruments than others. However the whole programme is highly entertaining and one of the more unusual tributes to the “birthday child”. 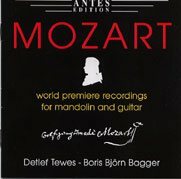 Would Mozart ever have contemplated the mandolin? Yes, he would. In fact he did use it, famously in the Don’s serenade in the second act of Don Giovanni. For this amorous and alluring music it fits like a glove and also works surprisingly well in the music on this disc. One must of course be willing to rethink the traditional approach. As a matter of fact much of the music needs very little rethinking since it was conceived for keyboard and the keyboard of Mozart’s time was not a modern concert grand but a forte piano. The sound of that instrument was much more brittle and thin, closer to the mandolin, which normally is allotted the melody. The deeper and rounder sounds of the guitar fill out the bass. By a coincidence I organized a Mozart concert the night before I listened to this disc. Several of the pieces here also appeared on my programme, albeit in the original versions – well, more or less. The Rondo alla Turca was played there, faster to be true, but the mandolin version doesn’t really come second best. Quite recently I also listened to Wanda Landowska playing the same rondo on her magnificent harpsichord (see review). That version stressed the janissary element of the music while never being as elegant as the piano or the mandolin. The A major sonata (tracks 3 – 11) is delicious, as is the C major sonata (tracks 13 – 15), not least the almost nonchalant first movement. The Variations on “Twinkle, twinkle, little star” start a little prosaic with a plodding presentation of the theme but catch fire in the variations, although tempos are generally much slower than most piano versions I have heard. Johan Westre played it at a rollicking speed at my concert. They also leave out the last three variations, which is a pity, but variation No. 9 is a perfectly valid finale on its own, so why complain?In the other music on the disc we are further away from the originals but it is still skilfully done. The Allegro movement from Eine kleine Nachtmusik is nicely varied in sound. Moreover, as the liner notes say, “not a single note of the original quartet version had to be left out”. Laudate dominum is beautifully played – and a beautiful melody, of course – but after some time one longs to hear the female voice, especially since I heard it sung most lovingly by mezzo-soprano Susann Végh the evening before. She also performed Voi che sapete from Le nozze di Figaro. The mandolin version is undoubtedly affecting, slower than usual but all the more expressive for that. They also play The Queen of the Night’s frighteningly difficult aria Der Hölle Rache with formidable drive and not a sign of technical problems. In the Adagio K 356 they manage to conjure up an eerie sound, at least vaguely reminiscent of the glass harmonica. As the finale to the whole disc, Laudate dominum is reprised, but this time in the version for mandolin orchestra, and since no other players are credited in the commentaries, I suppose this is Detlef Tewes playing all the parts. It is a full and romantic sound and a nice end to a recital somewhat out of the ordinary rut. The originals are, as so often, to be preferred, but the idea is so bold and the outcome so delicious that I urge readers to give it a try. The full 72 minutes in one sitting is probably not the optimal way of enjoying the disc, but played in smaller doses it is a charming and distinctive homage to Wolfgang Amadée.